Perfect for apartments and small spaces, our Model 1400 maintains optimal conditions for storing and aging fine wines. Clean, contemporary design blends equally well with modern, Craftsman, Deco or Asian decors. Hardwood doors and gently arched windows showcase fine wine collections. Sealed seams, premium insulation and tinted double-paned glass provide thermal and UV protection. Le Cache is bringing a fresh new approach to the wine cabinet market. Building on 14 years of experience, Le Cache is now offering an improved product and service quality. All Le Cache wine cabinets will ship within 3-5 business days of payment. Each model has three colors to choose from. Each model is fully loaded with solid cherry wood doors and an ultra-quiet CellarPro cooling system with digital temperature and humidity control. Le Cache has also updated the design of the cabinets to feature contemporary windows, universal cherry wood racking and top ventilation for zero setback installation. With its classic arch window and single door styling, the Model 1400 features all the same upgrades and attention to detail offered in Le Cache's larger cabinets. The wood used in building and finishing your wine cabinet will determine how well the cabinet ages over time, and the window design and insulation used will determine how effective the cabinet is at preserving the conditions inside your cabinet and how hard your cooling system must work to maintain those conditions. The better your cabinet is insulated and sealed, the more years of trouble-free operation your cooling system will provide. Ask if your cabinet doors are made from solid wood or laminate; find out if the windows are made from glass or plastic; and ask what kind of insulation is used inside the cabinet walls. Le Cache products are constructed from the finest wood, glass and insulation materials. Le Cache uses cherry wood in all their cabinets, with solid cherry wood doors, double-pane tinted glass windows, 1-1/2" foil-faced expanded polyisocyanurate insulation and sealed seams throughout the cabinet. * The hinged side of each door requires 1" of additional clearance when open at 90°. 160 racked bottle capacity, 12 bulk bottle capacity, 1.2 cubic feet of bulk storage. Many manufacturers offer a RANGE of bottle capacities. Unfortunately, TOTAL bottle capacity is very different from RACKED bottle capacity. Make sure to find out how many bottles will be resting on racks versus how many bottles will be resting on other bottles. The distinction is important because bottles resting on bottles can break or get scratched, or labels can smudge or tear. Bottles on bottles also are much harder to access than racked bottles. You'll find that Le Cache breaks out their racked, bulk and total bottle capacities individually. Each racked bottle rests directly on the wood rack. The bulk storage is located at the top of the rack, where long-term storage and extra-large bottles can be carefully stacked on top of each other. Fits most individual wine bottle sizes, including Burgundy and Champagne bottles. Many manufacturers build racks that can handle standard wine bottles, but the racks won't handle a growing number of special wine bottle sizes, such as some imported wines, Champagne bottles, etc. Le Cache racks are built to handle almost every size of individual bottle including Champagne bottles. Whereas standard racking typically measures 3 1/4 inches wide, Le Cache racking measures 3 3/4 inches wide throughout the cabinet. Universal bottle capacity comprised of sealed cherry wood. Metal racks can scratch bottles and tear labels, and sometimes they can bend out of shape under the heavy weight of racked wine bottles. Try sliding a bottle in and out of a metal rack, then do the same in a wood rack. Which feels better to you? Le Cache all-wood racking is constructed from premium cherry wood, finished and sealed, and features the tiniest attentions to detail, including eased edges, tapered ends, precision fit, hot-glue assembly and double-sealed finish. Most manufacturers build their cabinets with oak wood, which has a strong and distinctive grain even after the "factory finish." The finish generally refers to the stain color which is applied to the wood. Make sure that you're happy with oak's grain and texture before you purchase your cabinet. All Le Cache Classic Finish cabinets are constructed from premium cherry wood, including solid cherry wood doors. Their hand-stained Classic finish was created to highlight the beautiful grains of natural cherry wood. After staining, a clear-coat sealant is applied by hand - twice - to protect and enrich the wood finish. Designed and built by the same people who bring you Le Cache, the ultra-quiet, vibration-free CellarPro includes upgraded components and new features, resulting in an advanced cooling system that outperforms the competition in every category. 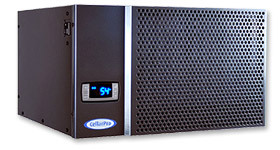 Each CellarPro cooling unit comes with an electronic thermostat and digital LED display, allowing you to precisely set the desired temperature inside your cabinet. In addition, the cooling system features automatic defrost to prevent ice build-up and adjustable humidity control that easily maintains the optimal humidity, up to 70% RH. 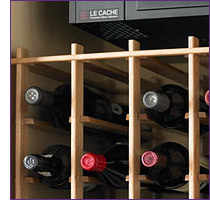 Le Cache believes that wine bottles, not the cooling unit, should be featured in your cabinet. If you have glass windows on your doors and your cooling unit is painted a light color, make sure that you like what you see when the doors are closed. Le Cache wine cabinets are sold with custom cooling units from CellarPro. Each unit is powder-coated grey so that it's "hidden" inside the cabinet when the doors are closed. The cooling system may be upgraded to the CellarPro 1800-XT, which offers extra cooling power with slightly more noise (approximately 10 dBA higher) and is designed for larger wine cabinets, warmer environments and/or commercial applications. Many cooling systems require at least SIX INCHES of space between the wall and the cabinet in order for the cooling system to operate properly. Even with top-vent cooling systems, many cabinets require THREE INCHES of space between the wall and the cabinet. Le Cache cabinets are loaded with features, including premium cherry wood, double-pane glass windows, digital display and temperature control, top-vent cooling, universal racking, factory finish, light and lock(s) - all at one low price! And your cabinet is ready to ship within 3-5 business days of receiving payment of your order. Le Cache stands behind their products, offering 5 years of coverage on the entire cooling system, including all labor and materials. If your cooling system stops functioning, Le Cache will send you a factory-refurbished replacement cooling system, and you can return your original cooling unit to them for repair AFTER you receive and replace the cooling system. That way, your wine won't go unprotected unneccesarily. Your cost is the freight to ship the the cooling system to and from the factory - Le Cache will take care of everything else. For two years from the date of original delivery, your Le Cache warranty covers all parts and labor to repair or replace any part of the product which proves to be defective in materials or workmanship. In all Le Cache upright wine cabinets, the heat generated by the CellarPro cooling unit is ventilated through the top of the wine cabinet. Consequently, there must be sufficient clearance above the cabinet for the hot air to dissipate. For Contemporary Series wine cabinets, you'll need 18 inches of clearance above the cabinet. See the table below for minimum ceiling heights. With the proper overhead clearance, the wine cabinet can be placed flush against the wall behind it. If you don't have the minimum required ceiling height above your wine cabinet, Le Cache can solve the problem by modifying the cabinet before it is shipped so that the air intake will come from behind (instead of above) the wine cabinet. Please note that, under this scenario, you will no longer be able to place the cabinet flush against the wall. Instead, the wine cabinet will need 3-4 inches of clearance from the wall behind and at least 8-9 inches from the ceiling above the wine cabinet. In all cases, the space above and to the sides of the wine cabinet must be unobstructed - i.e., the sides and front of the wine cabinet must be open. In addition, the wine cabinet must be placed in a space that is properly ventilated. The cabinet cannot be placed in an alcove, closet or built-in space unless an exhaust system is installed to evacuate the hot air generated by the cooling unit. In addition, access to the top of the wine cabinet is necessary to allow for periodic cleaning of the coils. Comments: Not only is the Le Cache wine cabinet beautiful, it is silent! It arrived in perfect condition and with the help of the easy-to-read Owner's Manual, we had it setup and filled with our favorite wine in no time. Thank you for adhering to such high-quality standards! Comments: I work in Sonoma/Napa area, and having the very best wine cellar for my wine inventory is critical. Comments: You guys nail it all. Quality unsurpassed. service aged to perfection - from start to finish. I've been impressed with your attention to detail. Comments: We received the Le Cache wine cave last week -- it is absolutely beautiful! Comments: This was our 3rd wine cooler. First one [different manufacturer] didn't have the right size racks. so we sent it back. Got a larger unit [different manufacturer] that had proper racks but it...was much larger than what we needed. So we spent more money but got a beautiful cherry cabinet from you with Universal racking! Delivery appointments are scheduled with 24 hour telephone notice prior to delivery. If a customer requires a specific time slot or if a weekend delivery is required, additional charges may apply.